The tagline on the poster says, "New Action Adventure." 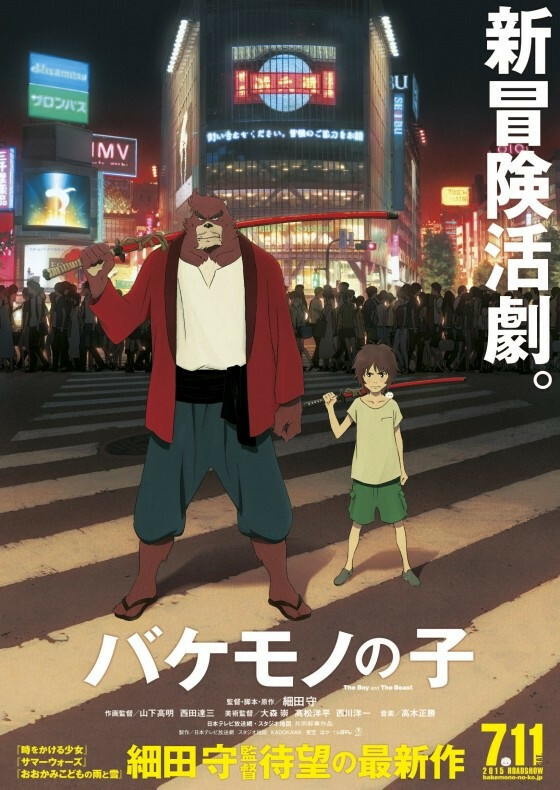 It is announced at the press conference at the headquarters of Toho today on December 11 that acclaimed director Mamoru Hosoda's new anime feature Bakemono no Ko/The Boy and The Beast is set for a release on July 11, 2015. This is his first film in three years since his biggest box office success Wolf Children in 2012. 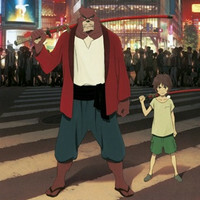 The film, based on Hosoda's own original story and screenplay, is set in human world Shibuya and bakemono (beasts) world called Jutengai. One day a human boy strays into Jutengai and encounters a bear-like swordsman Kumatetsu. He becomes Kumatetsu's apprentice and is given a name Kyuta. The film follows Kyuta's training and adventures with Kumatetsu. has worked on the storyboard since March 2014, finally tweeted "Storyboard is done." on December 4. Nishikawa. And Masakatsu Takagi, the soundtrack composer for Wolf Children, again works with Hosoda. The cast for the characters have not been decided yet. French film studio Gaumont is managing international distribution except Asia.